The gondola from the town of Breckenridge follows the contour of Shock Hill, follows the level top of it and continues to the base of peaks 7 and 8 of the Breckenridge Ski resort. Before there was a gondola this plateau was covered by the Breckenridge Nordic Center, wildlife and little by little private homes. One efficient use of this land was a group of clustered townhomes neatly fitted between Ski Hill Road and the Nordic Center’s long east-west running trails. The Settlement townhomes for sale are a small group of homes next to White Wolf. They are similar in style to their neighbors, but were built with a much larger living area. Set efficiently on a small lot, these townhomes have low yard maintenance, but are surrounded by open space. Skate out the door for a great workout at the Nordic Center from any home for sale in the Settlement, or cruise across the trails to the gondola or out to Ski Hill Road to catch the free shuttle to the base of Peak 8, or downtown Breckenridge. Start your search with the Settlement townhome listings below, or read more about this this popular neighborhood. In the summer, trails radiate from the area to national forest, and some, including a paved sidewalk lead to town. The Cucumber Gulch Wildlife Preserve is nearby, and offers a setting with streams, wetlands and wildlife. Cross-country skiing is steps away and the base of the mountain just a half mile up Skl Hill Road and reachable by car, bus or gondola. The Settlement is located on Shock Hill, which is a small plateau above the town of Breckenridge below the base of the Peak 8 of the Breckenridge Ski Resort. The area has been developed with high-end homes with reserves for wildlife and open space. These townhomes are is a less-expensive way to own a home on prestigious Shock Hill, which is close to both the lifts and downtown. Size: 2097 sq. ft to 3014 sq. ft. 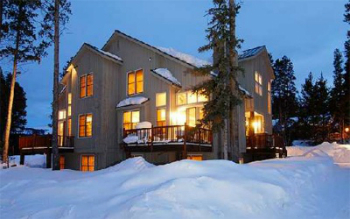 Amenities: Nordic skiing, nearby wildlife preserve, on shuttle route, trails, sidewalk to town, close to the base of Peak 8. From the traffic circle on the north side take Park Ave take a right - or from Main Street Breckenridge, go west - on Ski Hill Road, continue one half mile to Settlers Drive and turn right. Two of the homes are on the left and the remaining 8 are on the right side of Settlers Dr.
Do you have any questions about Breckenridge real estate? Then talk to the local pros! Give us a call today at (970) 453-2200 or send us a message online.